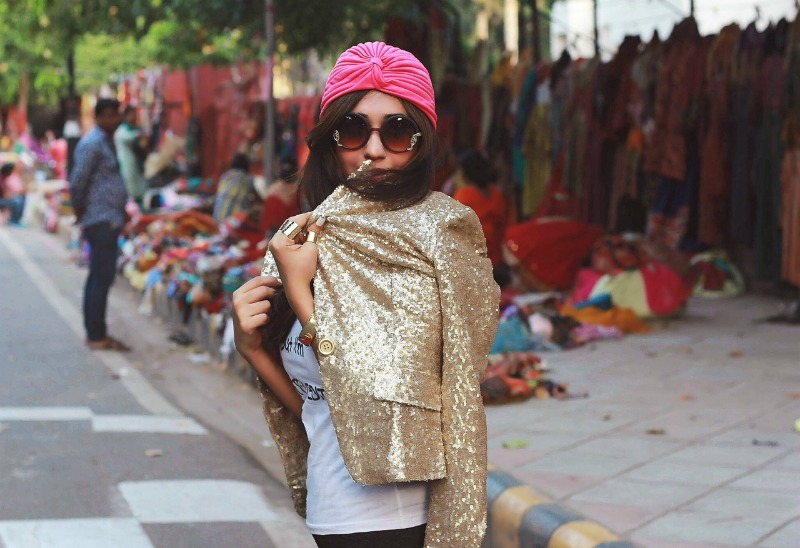 There had been some trends which I was contemplating to try, And this turban trend was one which I wasn't even sure of. I didn't even know if it was a thing. I wanted to wear it with some sparkling diamonds or bold lips. But chose my glittery blazer instead. 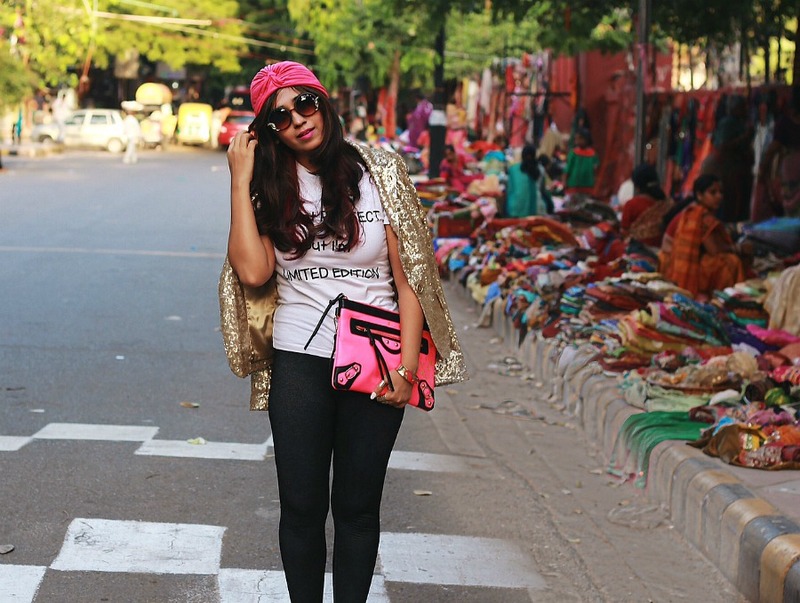 According to me, the turban adds a lot of drama to this basic white tee and pants look . The best part is that I didn't even want to buy a turban. Hubby bought it for me, thinking it would be a nice alternative for a wrap during my winter swimming sessions. Clearly his choices are more practical than sartorial, lol. But thanks to him, I had an accessory that could be sported in any way I wanted. So evidently I rocked up wearing one, on my way to a Glitz party,and the theme was Diamonds.I simply had to wear this blazer, and later before we reached the venue, I even attached my Jeweled Emerald earring onto the turban . Trust me I had enough people staring at me for the shoot. People even stopped their vehicles and paused to look until I opened the floodgates of my verbal slam. Whether it’s a traditional head wrap style or a headband, or a full turban, it’s the season newest flavor and a show stopping way to top anyone’s look., and am so so glad that I checked this trend off too. 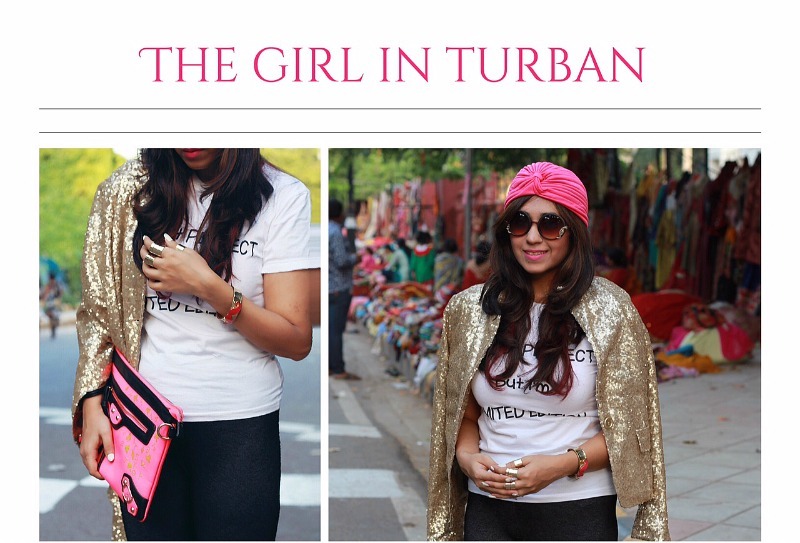 P.S- My turban look was featured on Society.Co which is an online lifestyle magazine headed By Nisha Balwani.They curate content for the young South Asian generation, on a lot of topics which I am sure you would love to read.Follow them, show them some love coz its simply fascinating to read traditions with a modern touch and an enchanting way to learn trends and ideas. 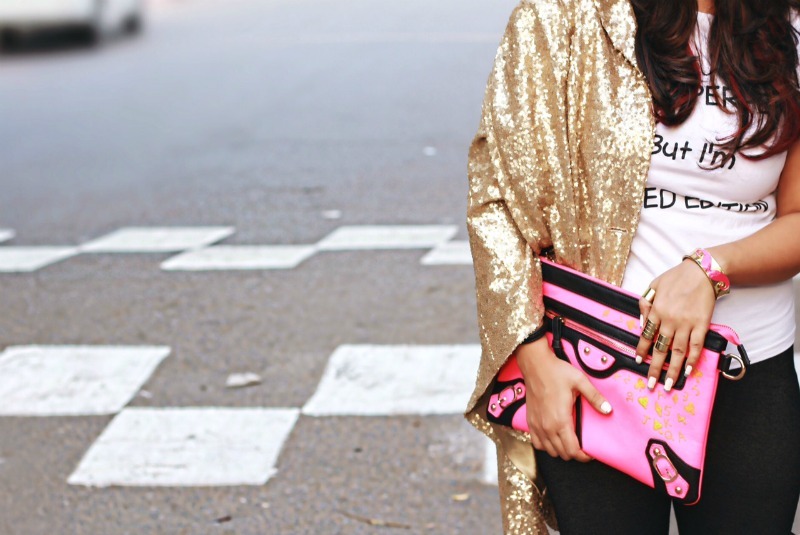 Love the pink and gold accents, very cute! 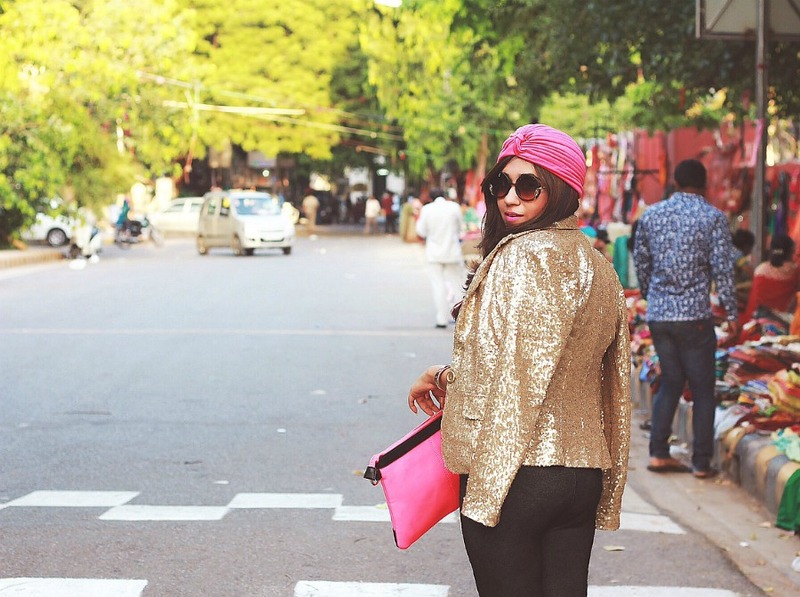 The basics glamed up with turban and the jacket. It is best of both worlds. Your style is so unique, love this outfit! the turban is so nice, and the colour is even more gorgeous. I also love the sunglasses. Love it dear, specially that amazing jacket! Amazing look! I love the mix of dressy and casual details! The girl in turban is such a stunner! You look glam here, honey. 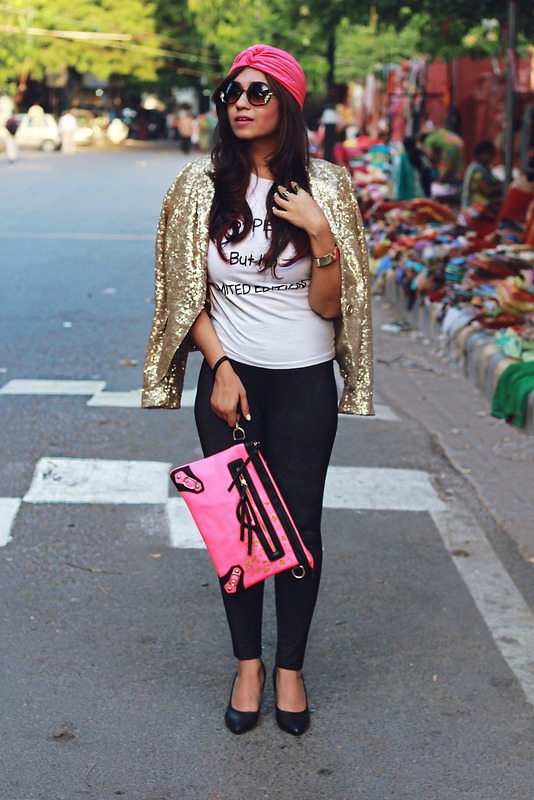 The golden_glittery blazer is gorgeous. WOW, the jacket is so stunning. love it. I love this turban on you! You look beautiful! 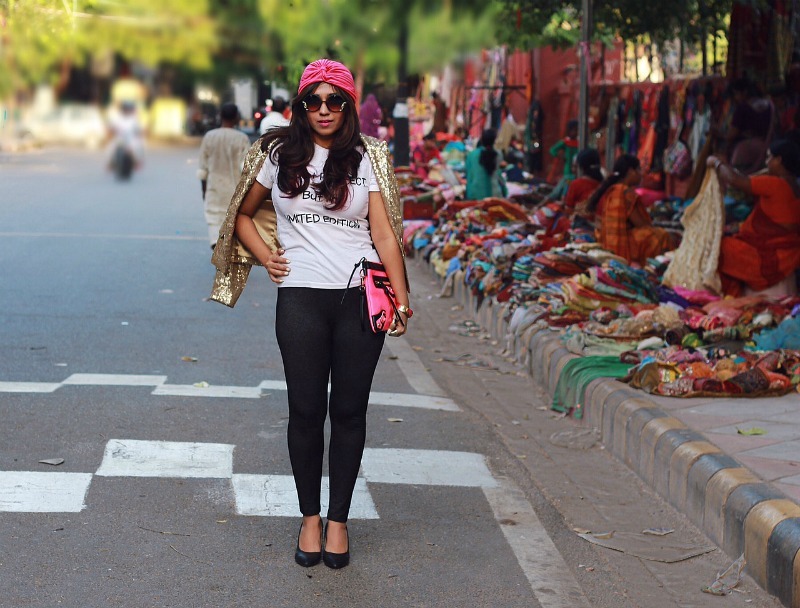 turbans are interesting & you look really cool wearing it :) actually your whole outfit is awesome. I love your golden blazer!!! Great look... love the turban!!! Shine on my dear! Great look, I love that turban congratulation on your featured on the online mag!, yes let's support each other I will follow you in all your social media. Have a great weekend. What a stunning outfit, I love the turban on you and the golden blazer is also very pretty! I love everything you have going on here. 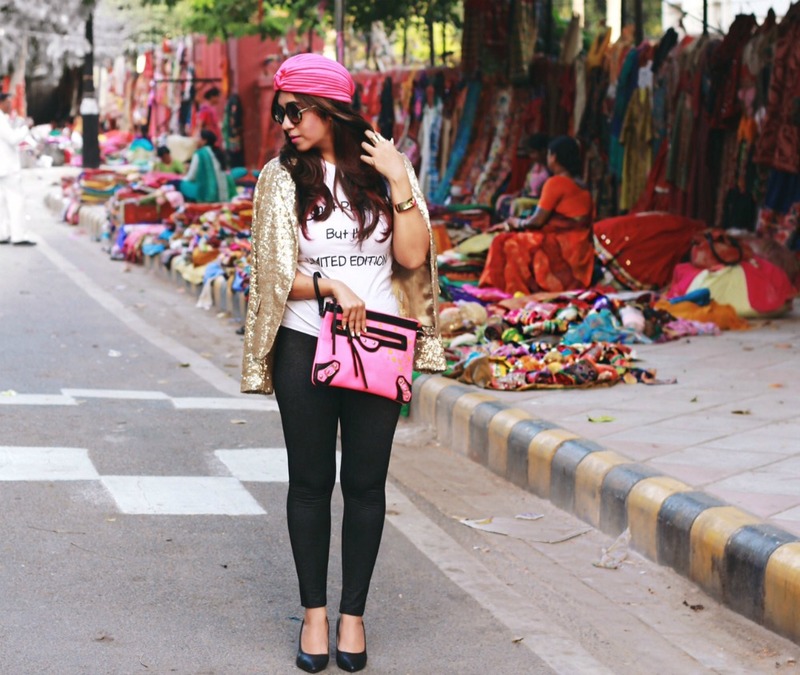 The turban, blazer, shoes...all of it! Fabulous! I cannot imagine anyone other than u rocking this turban look. more power to u girl..!!! Oh dear, you look so cute with the turban ! I like your golden jacket, have a nice day! You look absolutely amazing--let those people stare in jealousy of how fabulous and chic you are, am I right? Congrats on getting featured as well! 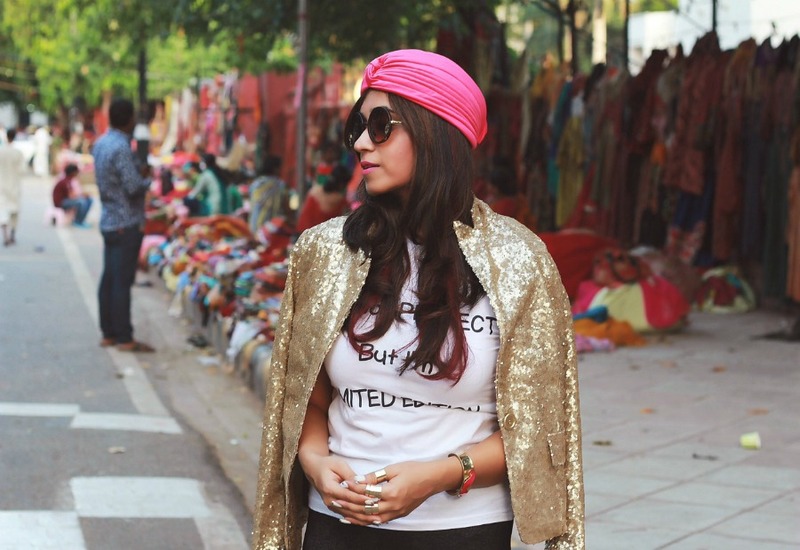 Really loved the way you styled the turban ! Hi! :D Thanks for passing from my blog and for commenting! Love your style! *-* This outfit is amazing! LOVE your outft. You look fantastic!